The aim of the 2016 initiative, Called to be Holy, was to contribute to the spiritual renewal of Catholic life in England by drawing on and sharing widely the rich treasures of English spiritual writers from the author of the Cloud of Unknowing to Michael Ramsey. . . . . click here to read more - click here again to hide the extended text. 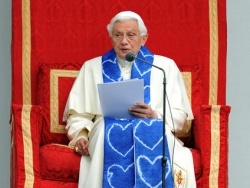 Called to be Holy draws its inspiration from the Apostolic Constitution of Pope Benedict XVI Anglicanorum coetibus, published in November 2009, which specifically refers to 'many elements of sanctification and of truth that are found outside the Catholic Church's visible confines. These are gifts properly belonging to the Church of Christ; they are forces impelling towards Catholic unity. They are a precious gift nourishing the faith of the members of the Ordinariate and a treasure to be shared'. Called to be Holy is intended to contribute to the spiritual renewal of Catholic life in England by drawing on those elements of sanctification to be found in the riches of English spiritual writers, to make evident the truth and beauty contained in Catholic teaching and life in a way that will have a particular appeal to sensitivities fashioned by Anglican and English traditions, and as the specific gift the Ordinariate brings to the Catholic Church in England and to our common task of evangelisation. The Called to be Holy Novena was observed from Friday 15th May to Saturday 23rd May, that is from the Ascension to Pentecost. Ordinariate Groups across the country hosted a day of recollection, during the Novena. Although the original dates of the Novena have passed, it is still possible to join in a 'virtual' Novena by following the spiritual writings, prayers and reflections published on this website. 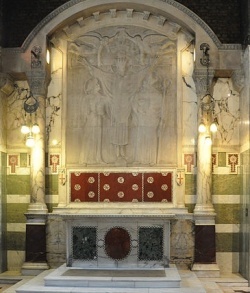 It is hoped that this initiative by the Ordinariate of Our Lady of Walsingham, Called to be Holy, will appeal to members of our Ordinariate Groups, to our brothers and sisters in local Catholic Dioceses and Deaneries, and to our brothers and sisters in other Christian communities, as we all seek that constant renewal of our spiritual life in Christ which is the essential foundation to the task of offering the good news of Jesus Christ to the people of this land, once renowned as the Island of Saints and as Our Lady's Dowry. The Ordinary of the Ordinariate of Our Lady of Walsingham, Monsignor Keith Newton, launched this initiative for 2015 with the title Called to be Holy. In the video link (right) Mgr Keith speaks about Called to be Holy. For September, we pray and reflect with John Keble. Please join us - click on the 'English Spirituality' button above. The Called To Be Holy Novena of Prayer is now permanently available as a resource on this website: just click on Novena Day by Day above. You will find information about the authors, and a 'short office' - a reading, psalm and collects - for each day. So if you missed the Novena, or would like to pray it again, or want to return to something that touched your heart during the Novena days you can still pray with us. ...for joining with us in the Novena of Prayer. May the Spirit of Truth continue to move the hearts of all who value our English spiritual heritage to work for the unity of Christ's Church. Ut unum sint! Please tell us how you used the Novena in your group - click on Contact Us above. Many of us will have sung this hymn - the 'Golden Sequence' - on Pentecost Sunday. It is a translation of Veni Sancte Spiritus, attributed to Cardinal Stephen Langton, Archbishop of Canterbury between 1207 and his death in 1228. 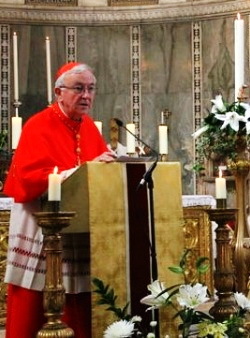 A homily given by Cardinal Vincent Nichols on the Solemnity of the Ascension of the Lord, 17 May 2015, at the Church of Our Lady of the Assumption, Warwick Street. On this feast of the Ascension of the Lord, we take a further major step in our celebration of the Paschal Mystery, the exploration of our Easter faith. I am delighted to be celebrating this great Feast here in the Church of Our Lady of the Assumption Warwick Street in the community of the Personal Ordinariate of Our Lady of Walsingham. Thank you. 'In ancient times, Christians all over the world began with a morning salutation to his neighbour 'Christ is Risen'; and his neighbour answered him, 'Christ is risen indeed and hath appeared unto Simon'. These words, of course, come from the Blessed John Henry Newman, from his Parochial and Plain Sermons. I have borrowed them from the booklet that has so carefully been prepared, in the Ordinariate, for the Novena of Prayer Called to be Holy which is now in its third day. Thank you for that initiative. Newman's first experience of Catholic liturgy and prayer occurred of course here in this church. It flowered slowly in his life yet the essence of the fullness of that Catholic faith can be recognised in this passage. In these reflections on the centrality of the resurrection, he develops that sense in two ways. Firstly he recognises the appearances of the risen Lord as a great act of God's mercy, for he continues: 'Even to Simon, the coward disciple who denied him thrice, Christ is risen; even to us who long ago vowed to obey him and yet so often denied him before men, so often taken part with sin and followed the world when Christ called us another way.' Today we renew in our hearts our loving gratitude to a Lord who looks so kindly and mercifully upon us. Then, secondly, Blessed John Henry points to a further meaning of the appearances of the Lord to Simon Peter. He writes: 'To Simon Peter the favoured Apostle, on whom the Church is built, Christ appeared. He has appeared to his Holy Church first of all, and in the Church he dispenses blessings, such as the world knows not of.' Today we rejoice in our full and visible communion with Peter, with his successor, Pope Francis, for it is within this communion that the words of Newman find their fullest expression: 'Blessed are they in that they knew their blessedness, who are allowed as we are, week after week, and Festival after Festival, to seek and find in that Holy Church the Saviour of their souls!' Today we pray for the visible unity of the Church, despite our many divisions and scattered gifts, so that a more powerful witness to the full richness of all God's tokens of love may be offered to our world. May our faith in the risen Lord strengthen this resolve within us. Today we particularly reach out to embrace the wonder of the Ascension of our Blessed Lord into heaven. This is surely the Festival of the unfolding of our destiny. We pray that where He the Head has gone may we his Body most certainly follow. Our faith, and the witness we wish to give, is centred round this promise. Our destiny is, quite simply, the fulfilling in each of us of the Paschal Mystery we are celebrating. From the moment of our first existence, this has been the Father's loving purpose in creating us: that we will come to share in the eternal life of heaven, in the inexpressible joy of His presence. We too are to ascend into heaven and share in that eternal glory. This is what makes sense of all we try to do each day. And when that destiny, that true purpose or finality of life, disappears from human sight and striving, then faith is flattened and sooner or later loses its true depth and attractiveness. Here too we learn about the Father's mercy. The first act of God's mercy towards each of us is the gift of life and of a life that is not without purpose, not ultimately futile just as many fear. Rather it is endowed with the most wonderful of promises. The mercy of God, on which we are invited to ponder continually, is nothing other than the restless love of the Father longing for us to receive and embrace our true destiny. His merciful love is never exhausted, but flows to us time and again that we may start out afresh after every failure and disappointment. Those who counterpose the mercy of God with the commandments of God misunderstand both mercy and commandment. The commandments of God are given to us as a mercy, to help us how to live on the pathway of our true dignity and highest calling. They are not restrictions on our legitimate freedoms. They are not rules that above all else we have to obey. Rather they are the unfolding into practical living of our deepest nature and destiny. God's mercy then is not something which enables us to overlook those commandments or somehow imagine that we are excused their calling. Rather it is the eternal restlessness of God's love calling us again and again to raise our eyes beyond the horizons we have set for ourselves, the limits of what we believe we can manage, the limits of what we think can reasonably be asked of us. He calls us to reach out again for the fullness of his love, opening our hearts again to its light and joy. Mercy enables us to start out again, not stop where we are comfortable, not satisfied in just being accepted as we are. At the heart of our spiritual lives, then, lies this deep desire: that all we do may be in accordance with this overwhelming will of God for our salvation, for our fulfilment. Our salvation is secured. This we know. My work is not to earn or effect that salvation, but to walk in its path, to grasp the gift and rejoice in it. This, indeed, is our pathway to our ascension, for in union with Jesus all things can be turned to the service of the Father and brought, in His day, to be placed before his throne. No longer do our days lack a clear and definite sense of purpose! At the Ascension, the Lord leaves behind his bodily presence among us so that he may be with us in new ways, not limited by time or place. Those new ways we celebrate most fully through the great Festival of Pentecost, with which the Paschal Mystery is completed. Though the great outpouring of the Holy Spirit the merciful presence of the risen Lord will abide with us always. Yet this new presence, by which he nurtures and strengthens us every day, retains a wonderful kind of physical presence, something that we can come to, locate, behold, touch, and receive. Today we bring all our best gifts to this celebration of the risen and ascended Lord. In this Liturgy we are again taken up into the mystery we celebrate, it is our destiny and therefore our deepest joy. Here, again, we learn who we are: a people bound together in Christ and in the mystery of His visible Church. Here we learn again what we are to be: raised on high into the fullness of the light and joy of God, a wonderful and awesome prospect which we could never imagine or grasp of ourselves, yet given to us by the gracious and free gift of the Father. In his mercy, expressed so fully in the face of our Saviour, and made so powerfully effective in the outpourings of the Holy Spirit, may we journey towards his Kingdom, using all our wit and wisdom to make known this great mystery, for which our world so painfully longs. Amen. Arthur Michael Ramsey was born in 1904, and became 100th Archbishop of Canterbury in 1961. He longed for the unity of the Church: he did much to build relationships between the Church of England and the Eastern Churches, and was disappointed when plans for union between Anglicans and Methodists failed. In 1966 he became the first Archbishop of Canterbury in modern times to make a formal visit to the Vatican. 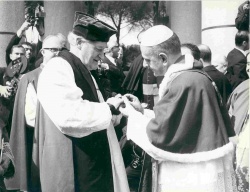 Pope Paul VI took off his own episcopal ring and gave it to Ramsey, who wore it until the day he died. The ring is now worn whenever Archbishops visit the Vatican. Shy and considered by some to be eccentric, Ramsey was a man of deep spirituality and highly regarded as a retreat conductor. He was unafraid in speaking out against the social injustices of his day. Some of his most moving and powerful words were given as ordination charges to the clergy of Durham (such as today's reading) when he was Bishop there from 1952 to 1956. In the first half of the 20th century Evelyn Underhill was one of the most widely read writers on spirituality. She moved from an agnosticism to faith, but her husband Hubert Stuart Moore was opposed to her desire to become a Catholic. She found what she believed to be a staging post in Anglo-Catholicism, but remained there all her life. Her spiritual mentor from 1921 to 1924 was Baron Friedrich von Hugel who encouraged her to focus her mysticism in Christ. Both before and after the First World War there was great fascination with philosophy, spirituality and mysticism among British people. Evelyn Underhill was concerned that ‘state religion’ was out of touch with this deep longing and in her writings sought to popularise an orthodox Christian approach to the spiritual world. She was not without her critics for her attempts to make the mystical life open to ordinary people. Mysticism (1911) and Worship (1936) were among her most influential books. Newman was born in 1801, grew up in London where his father was a banker, and came under the influence of the Evangelical revival in his teenage years. In later years he always looked back at this as the saving of his soul, yet came to believe that Evangelicalism, in rejecting the Church, opened the door to liberal interpretations of the Christian faith. In 1821 he graduated from Trinity College, Oxford, and the following year was elected to a Fellowship at Oriel. In 1825 he was ordained a priest of the Church of England, and in 1828 became vicar of the University Church of St Mary the Virgin. Various influences (reading the early Church Fathers, for example) played on Newman as he began to move away from the Low Church party of the C of E. On 14 July 1833 John Keble preached his famous sermon, ‘National Apostasy’, which Newman later judged to be the start of the Oxford Movement, which set about restoring to the C of E discipline and doctrine in accordance with the Book of Common Prayer. The publication of the Tracts for the Times caused a furore across the country, but in time Newman came to doubt whether the middle way of the C of E (between Roman Catholicism and Protestantism) could be upheld. In 1845 he was received into the Catholic Church and ordained priest the following year in Rome. He returned to England as an Oratorian, finally settling in Birmingham. His scholarship, from both his Anglican and Catholic days, has been widely revered, as has his mastery of the English language. It has been asserted that Newman’s theological thinking, not always appreciated in his lifetime, found its expression in the renewal of Catholic life with the Second Vatican Council. Born at Little Berkhamstead in Hertfordshire, Thomas Ken was for a time tutor at Oxford, before his ordination in the Church of England in 1662. After serving in a number of parishes, he became Prebendary of Winchester, and chaplain to the Bishop. During this time he began to write the hymns for which he is best remembered, including ‘Awake my soul and with the sun’, for using in the morning, and ‘Glory to thee, my God, this night’ for the evening. In 1680 King Charles II appointed Ken one of his chaplains. Although popular with the King, Ken refused to provide accommodation for Nell Gwynne, the King’s mistress, in his house in Winchester. In spite of (or maybe because of) Ken’s conscientiousness, Charles appointed him Bishop of Bath and Wells. Among his first duties as a Bishop in 1685 was to minister to the King on his death-bed. In 1688 Ken was among the group of Bishops imprisoned by King James II for their refusal to read the Declaration of Indulgence which he regarded as compromising the position of the Church of England. He and his fellow Bishops were acquitted, but when Parliament replaced James with William of Orange and Mary, his wife, Ken refused to take a fresh oath to the new King and Queen. So he was deprived of his see, thus joining the ranks of the Non-Jurors. He retired to Longleat House in Somerset, and died in 1711. Born soon after the break with Rome, Lancelot Andrewes was ordained to the ministry of the Church of England in 1580. A noted linguist and preacher he was by 1601 Dean of Westminster. During the reign of King James I he was successively Bishop of Chichester, Ely and Winchester, and oversaw the compiling of the Authorised Version of the Bible. The Cloude of Unknowyng was written in Middle English in the second half of the 14th century by an anonymous author, sometimes thought to be a Carthusian (Michael Ramsey, whom we shall meet later in these pages, believed the author to be a woman). It is a guide for a young person who desires to grow in the contemplative life. The work draws on the ancient mystical tradition of the via negativa, saying of God that ‘by love he may be caught and held, but by thinking never’. The seeker is advised that God’s grace is always utterly undeserved: we must strip away all intellectual desire for knowledge and control and be content to wait meekly in unknowing for the gift of contemplative prayer, which is described as God’s ‘work’ in us. It is to be truly ‘oned’ with God. 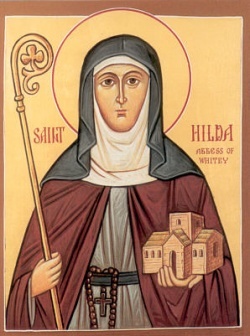 Hilda grew up at the court of her uncle, King Edwin, and was baptised and educated by St Paulinus. 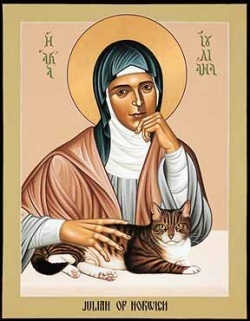 She entered religious life at the age of thirty-three, and in 657 she founded a double monastery of monks and nuns at Whitby, which soon became a famed centre of learning. Bede tells us that she ‘began immediately to order it in all things under a rule of life, according as she had been instructed by learned men; for Bishop Aidan [of Lindisfarne], and others of the religious that knew her, frequently visited her and loved her heartily, and diligently instructed her, because of her innate wisdom and love of the service of God.’ Hilda’s connection with St Aidan strengthened her great love of the Irish Christian tradition, but she was also passionate about the unity of the Church. In 664 she hosted the Synod of Whitby where her guidance helped ensure that the Northumbrian Church came to follow the authority of Rome in such matters as the dating of Easter. She was known by all as ‘Mother’: among those she encouraged was the illiterate shepherd (or cow-herd) Cædmon, ‘joyfully recognising the grace of God in the man’, as Bede says. Cædmon’s divinely inspired song of praise for the Creator (today's reading) is the gift of them both to the Church. The Dream of the Rood is perhaps one of the earliest works of Old English literature, possibly written in the eighth century by an unknown poet. It recounts a dream in which the narrator sees a tree - the Cross - resplendent with jewels, but also stained with blood, that stands at the centre of the earth. The Cross tells the dreamer its story: wounded like its Lord by the cruel nails and enduring the mocking with him, it stands firm as the throne of the hero-king, the incarnate God, who willingly embraces suffering and triumphs over it to redeem the whole world. 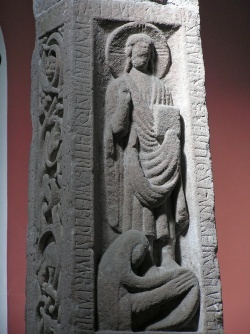 Passages from the poem were carved on the Ruthwell Cross in the ninth century. Remember the Called To Be Holy Novena begins this Friday. Simply click on Novena Day by Day above for the reading, psalm and collect for each day. Please pray with us! If you would like a paper copy for yourself or as a gift for a friend, click on Novena Booklet. And don't forget the Children's Novena! We have been asked about the pictures we chose for our prayer cards, and as there was not enough room on the cards themselves to include a description, we thought we would tell you a little about them here. They were all chosen as examples of English spiritual art (a reminder that the 'riches of English spirituality' on which we have drawn for Called To Be Holy are not confined to the written word). All of these images have been used to enhance the worship of God through the ages. This is a detail from the Syon Cope, now in the Victoria & Albert Museum in London. 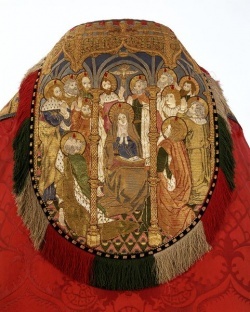 It was made between about 1300 and 1320 and is an example of Opus Anglicanum, the elaborate embroidery for which the English were particularly famous. The image refers to Revelation 12:7-8, 'And war broke out in heaven; Michael and his angels fought against the dragon. The dragon and his angels fought back, 8 but they were defeated, and there was no longer any place for them in heaven.' This seemed a good image to contemplate during Lent. Devotion to the five wounds of Christ was an important spiritual practice throughout Europe in the Middle Ages. This is a painting from the mediaeval Rood Screen in Binham Priory, Norfolk. During the Protestant iconoclasm of the sixteenth century the image was painted over with whitewash and words in Black Letter script from Cranmer's Bible of 1539: For coueteousnes of money is the roote of all euyll...(1 Timothy 6:10-12). We can now see the restored image and look again, as Christians before us did, on the face of the risen Lord. Many people will recognise this as an illustration from the Lindisfarne Gospels: an illuminated manuscript gospel book produced around the year 700 in a monastery on Lindisfarne (or Holy island) off the coast of Northumberland. It can now be seen in the British Library in London. The manuscript is one of the finest examples of 'Insular' art which combines Mediterranean, Anglo-Saxon and Celtic elements. 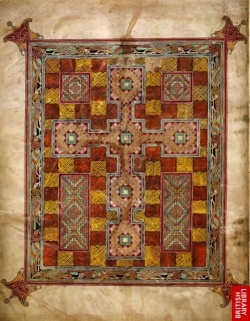 This is what is sometimes called a 'carpet page': the geometric design with a repeated pattern squares represents the Gospel being taken to the four corners of the world. The Cross is empty - Christ is risen - but the whole page teems with symbols of new life in the Spirit. Among the rich colours, red represents life-blood and love, while gold stands for the radiance of heaven. The knot work, with spiral patterns going into the centre and back again, tells us about the journey into God of the Christian life; the intertwined animals and birds framing the Cross represent creation in all its vitality. This is Mary's Call To Be Holy - and ours. May Our Lady pray for us her Son's prayer, ut unum sint, and may we pray it with her this May, to the greater glory of God. The image above is from the May Procession of Our Lady at Most Precious Blood, The Borough - home of the London (South) Ordinariate Group. There is something I very much want to say to you. I hope that among those of you listening to me today there are some of the future saints of the twenty-first century. What God wants most of all for each one of you is that you should become holy. He loves you much more than you could ever begin to imagine, and he wants the very best for you. And by far the best thing for you is to grow in holiness. There will be resources for children's activities available very soon, so that they too can share in our Called To Be Holy celebrations - watch this space! Once again, Ordinariate groups will be hosting events in their own areas. The heart of the celebration will be a Novena from May 15 to 23 (Ascension to Pentecost); all Ordinariate members are encouraged to join in - and to invite family and friends to pray with them. Groups will soon be receiving copies of a booklet containing material for prayer and reflection drawn from writers in the English spiritual tradition, from the eighth century Dream Of The Rood to Michael Ramsey, 100th Archbishop of Canterbury. By now, we should all have seen the accompanying prayer cards, illustrated with examples of Christian spiritual art through the ages. Each group is asked to host a Day of Recollection, either during the week of the Novena or later in the year. We are asked to offer an invitation to other Christians to spend the day with us: our English spiritual heritage is one we can all share, in a powerful experience of praying together. Plenty of resources are available: a new DVD with a message from the Ordinary, a poster which can be personalised with details of local events, and materials for children’s activities. If you have not already done so, please download the poster here. The poster for the Called to be Holy Novena is now available for download. The Novena will run from Friday 15th May to Saturday 23rd May, from the Ascension to Pentecost. Ordinariate Groups across the country will be hosting a day of recollection, during the Novena. Details of local events in May will be posted on this website as soon as they are available. It will also be possible to join in a 'virtual' Novena by following the spiritual writings, prayers and reflections published on this website.